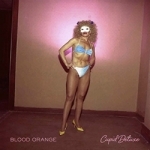 You're Not Good Enough is my choice track from Devonté Hynes' Blood Orange LP Cupid Deluxe. Although Dev is very much in demand as a producer nowadays it's good to hear he still has time to write his own stuff. Shades of 80's Prince and Madonna and even a tad Fleetwood Mac, on this track he channels the best of all those influences, it could even be a lost track from Solange Knowles True EP, Samantha Urbani does a stellar job on the vocals dueting with Dev. Great LP.